Listed here are several resources that may be of use by you in placing students in a work-based learning environment. These resources are limited to documents related to student placements, web resources for placement info, web links to Workman Compensation verification, and student task lists to name a few. Also listed here are links to various organizations that support work-based student placements including the Michigan Career Placement Association (MCPA) which is a valuable organization which supports the placement specialist with conference opportunities, networking, and answers to your questions. Another organization which may be of help to those educators placing students with special needs, is the Michigan Transition Services Association (MTSA). Both of these organization are very good resources for information and very helpful. 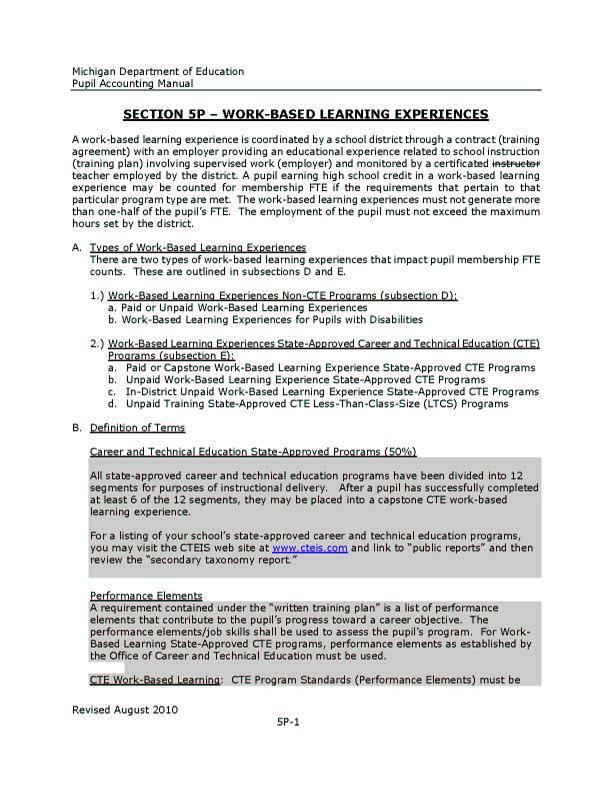 This section of the MDE Pupil Accounting manual contains all the pertinent rules and regulation information related to student placements (CTE, Paid & Unpaid Work Based, and Special Education/Transition) in a work-based setting. It is suggested that you carefully read this document to ensure that all of you student placements are in the students best interests, conform to the required rules and regulations, and protect the student from any dangerous situations. Verification Link This link will allow you the opportunity to key in a company name and verify that they are carrying a valid workman's compensation insurance policy. It should be noted that you may have to key in the holding company name instead of the business name (ie: Moll Holdings, instead of Burger World). If all else fails, feel free to contact the department using the telephone number identified. Training There are numerous web sites that offer safety training in some form or another. Here is one that is presented by OSHA, which many have found to be a useful resource. Career & Tech Educ. The Office of Career and Technical Education (OCTE) oversees high school instructional programs that teach students skills in a specific career cluster. The mission of the office is to prepare students so they have the necessary academic, technical, and work behavior skills to enter, compete, and advance in education and their careers. O*NET On-line This website will assist you with detailed descriptions of the world of work for use by job seekers, workforce development and HR professionals, students, researchers, and more! MI Career Portal Search for jobs, explore careers, and find education and training opportunities. Resources are also available for employers, teachers, students, and parents. Website This organization provides the placement specialist with numerous opportunities to learn about the do's and don'ts of placing students in a work-based learning situation. It is also a great opportunity to network with colleagues at the numerous regional meetings held state-wide. This organization is the "go to source" for information related to the rules and regulations related to student placements. Website The organization provides valuable information to those educators placing special needs students in a work-based learning environment. Combined with the resources of the MCPA, your student placements will always be accurate and the best learning environment for your student learners. This two day conference is repeated on the second day with the same information, so you need to attend one day only. At this conference, you will receive all the latest updates (rules & regulations) concerning the placement of students. This conference is a must for any school personnel who places students in a work-based setting. This conference deals with numerous aspects of career education from training programs to student placements and almost anything you can think of in between. This conference is aimed to the educator who works primarily with special needs students. This conference is a "must attend" if you work with our special students. You'll walk away with numerous ideas to implement in your classroom or program.